Throughout the ages and throughout the world, baskets have been twined, braided, and coiled of organic materials – from quills and cane to vines and bark. Clay Burnette’s supply house is a temple of towering pines. His concisely ordered studio also is shrouded in urban woods. Even when he’s kayaking, drawing inspiration from the river’s visual splendor, the award-winning artist is enveloped in the natural world. The sheer uniqueness of his designs confounds categorizing and defies descriptions. “I especially like the fact that I can take an otherwise insignificant material such as long-leaf pine and turn it into an object of beauty.” Burnette said. The highly-collectible baskets he makes, usually no more than 10 or 12 each year, reflect the artist’s response to nature. Often woven in a relaxed, slumped formation, the baskets are at the same time precisely coiled and meticulously hand-stitched – usually, with natural linen thread. Their dichotomy is that they are epitomized by sculptural newness while what they bring current is one of humanity’s earliest innovations. When he makes forays into the woods in search of the longest pine needles he can collect, taking only what he believes he will be able to use in forthcoming pieces, Burnette often is reminded he’s not alone by the sighting of deer tracks or other evidence of wildlife. Once he returns to his studio, how he readies the pine needles for coiling is further evidence of his philosophy regarding nature. By 1977 Burnette already had learned to coil and make pine needle baskets and had exhibited his work in about a dozen shows before arriving at the University of South Carolina in his mid-20s to pursue three degrees: an AS in Retail Management in 1979, a BAIS in Art Studio and Marketing in 1982, and a MA in Library and Information Science in 1998. But his time in the Art department held sway over the other disciplines. “My exploration of color and texture kept me up until the wee hours of the morning.” In McMaster College he paid his dues weaving at a huge loom that allowed him little flexibility of expression, of when he could get time at the loom, and of design. Before beginning a piece, he arrives at only one decision: Will it be round or oval? Sometimes, he acquiesces to the needles’ natural coloration; other times he chooses a palette that enhances the design. Over the decades Burnette has experimented with natural dyes intended for fabrics, and even paints to augment the pine needles’ color. Although natural linen thread has been his choice for sewing the needles into their structure, he has used copper wire at times – and even telephone wire, strung with beads and natural stones, to enhance the aesthetic and durability of his baskets. Although it would be impractical for him to travel to every venue in which his work is showcased, the work itself is well traveled because it is so well received. From his very first entry into artisan competitions, he distinguished himself by having his initial submission selected, one of only 100, for the annual Smithsonian Craft Show. To date, his baskets have been invited into prestigious collections, from the White House to the Columbia Museum of Art. In addition to having his work juried into other of the nation’s most prestigious shows and purchased by some of the most discerning collectors, he is frequently asked to teach at revered artisan centers, such as Arrowmont Arts & Crafts Center in Gatlinburg, TN. He also will teach a class at the National Basketry Organization’s conference in Tacoma, WA in July 2017. 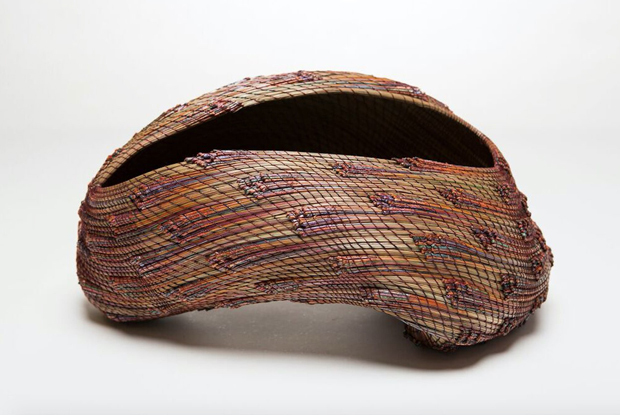 Burnette’s work is also included in Rooted, Revived, Reinvented: Basketry in America, which opens at the University of Missouri Museum of Art and Archaeology on January 28, 2017, and will travel to numerous venues for three years. For other venues and more information, visit http://americanbasketry.missouri.edu.